Updates are incredibly important as they keep your computer safe, but with Windows 10, Microsoft took the decision that it knew best and forces you to get updates, rebooting your computer automatically. Even worse, Microsoft decided that it would also update key bits of hardware with its own drivers automatically. There’s no way to completely turn off updates using a simple Control Panel option, and only check for them manually; so you can’t go back to the way you used to work with Windows 7 or Windows 8. With Windows 10, Microsoft has decided that updates have to be downloaded and installed, which makes sense from a security point of view, if not from a usability one. While you can disable the service that automatically updates your Windows 10 computer, it’s not a good idea to do so. Updates are important and can protect you from hackers and system instability. For this reason, it’s best to let Windows install updates, but manage how it does so and control when it can reboot your computer. The first, there are the tools that Windows has built in. To change these, click on Settings in the Start Menu and then select Update & Security. You can stop Windows from using your computer and internet bandwidth to seed updates; by default, Windows 10 uses a peer-to-peer technology that’s similar to BitTorrent to share updates. Click the Advanced link and then click Choose how updates are installed. 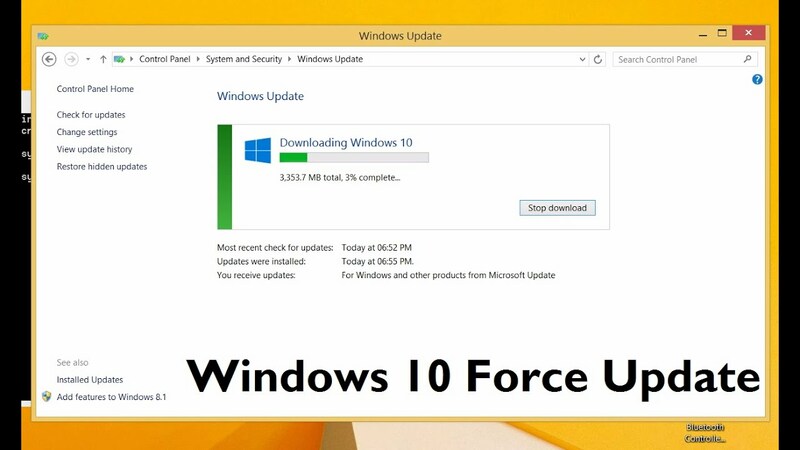 If you want to download updates from Microsoft only and not other computers on the internet, turn Updates from more than one place to Off. If you don’t mind downloading updates from other computers, but don’t want to share updates from your computer, leave the option set to On. Now, you can choose only to share updates that you’ve downloaded with other computers on your home network by selecting PCs on my local network instead. ​Windows 10 will automatically install updates and will reboot your computer where necessary. The only tool Windows gives you at the moment is Active Hours, where you pick a start and end time for when you’ll most likely be using your computer. During these hours, Windows won’t automatically reboot your computer. To change the times, go to Settings, Update & Security, and select Change active hours. Here you can set the start and end times. Currently, Windows only lets you set active hours for a maximum of 12 hours. With the Creators update, due for release later in the year, Windows will let you set an 18-hour window instead. If you really want to stop Windows from rebooting your computer, then you have to prevent the Reboot task from running. To do this, run Task Scheduler from the Start Menu and, in the panel on the left, go to Task Scheduler Library, Microsoft, Windows, UpdateOrchestrator. Right-click Reboot and select Disable. Windows 10 can re-enable this Task, but you can prevent this from happening. In an Explorer window go to C:WindowsSystem32TasksMicrosoft WindowsUpdateOrchestrator. Rename the Reboot file to Reboot.bak (you’ll need to provide Administrator permission). Now create a new folder called Reboot. This prevents Windows from re-creating the task, and your computer will never reboot automatically. To reverse these steps, delete the Reboot folder, rename the Reboot.bak file and re-enable the task.